The new Marriott Hotels Residence Inn Raleigh was recently recognized by the DRA with its Imprint Award. ColeJenest & Stone worked with Summit Hospitality Group and Overcash Demmitt Architects to provide project civil engineering and landscape architecture for the project. The 10-story Residence Inn is the first new hotel in downtown in five years. The $30 million project features 175 suites, all of which have kitchens with residential-size appliances. The hotel caters to longer-term guests with meeting spaces, a business library, free Wi-Fi, grocery delivery services, dry cleaning services, and an on-site laundry room. The Imprint award was given out during the 2018 State of Downtown Raleigh event. 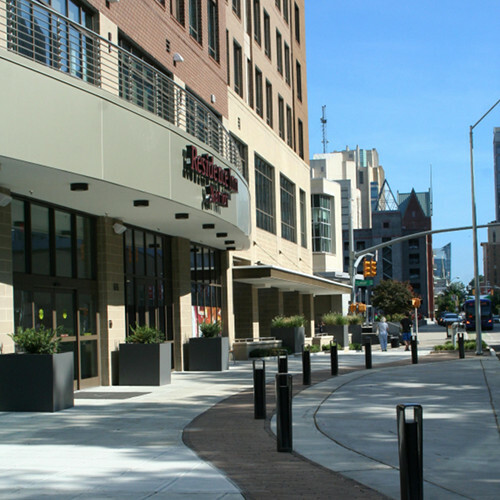 We are thrilled to be part of Raleigh’s growing downtown!